Ever since we moved into a house with a front yard, I have been mildly obsessed with decorating with garden flags — so much so that I started making my own. Even if you don’t have a yard, you can decorate your door by sticking your flag into a potted plant. While many themes are available for sale, I love being able to personalize my flags, and a dog-themed garden flag is a great project for the whole family! Fabric — I used nylon, but tightly woven burlap is great, too. You can also repurpose fabric from around the house — just make sure it will hold up in weather. Optional: Ribbon, rhinestones, buttons, appliques, etc. Dog-themed garden flag. Photography courtesy Samantha Meyers. Cut your garden flag to the size you want, adding 2 inches to the length. I measured one I had, which was 15 by 13 inches, so I cut my fabric to 17 by 13. There’s no exact science to this, just as long as it is not wider than your flag stand. Fold the top of your fabric over 1 inch, and hot glue or sew to the other side. Make sure it’s secure, as this will be the hole for you to hang your flag on the stand. Channel your inner artist and paint your doggie designs. You can also use stencils. Easy-to-draw dog designs include paws, bones and dog houses. You can even get your dogs in on the action, making paw prints with nontoxic paint. Write your dog’s names on the flag, or draw her portrait. The sky’s the limit! If you want to add a little extra pizzazz, glue on items like buttons, ribbon or rhinestones. Allow to dry, and hang in your yard with pride! You can make custom dog flags for every season by changing the colors and words you put on your flags. Adding holiday ribbon or seasonal designs is a great way to welcome dog and human visitors to your door. Make a Doggie Bow Tie — No Sewing Required! 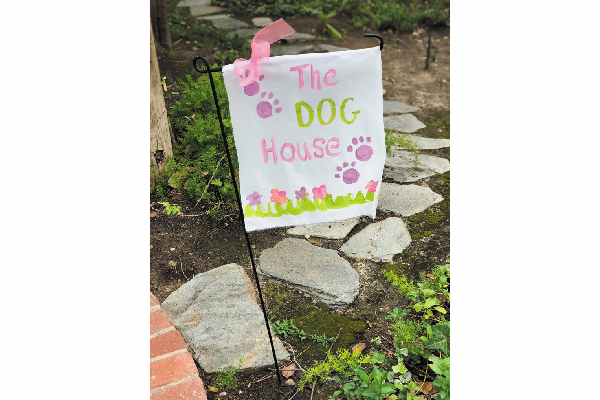 The post DIY: Dog-Themed Garden Flag appeared first on Dogster.